This endemic gall fly is known only from Auckland and Northland. It was first found in 2003 at Karekare on the west coast of the Waitakere Ranges, Auckland. 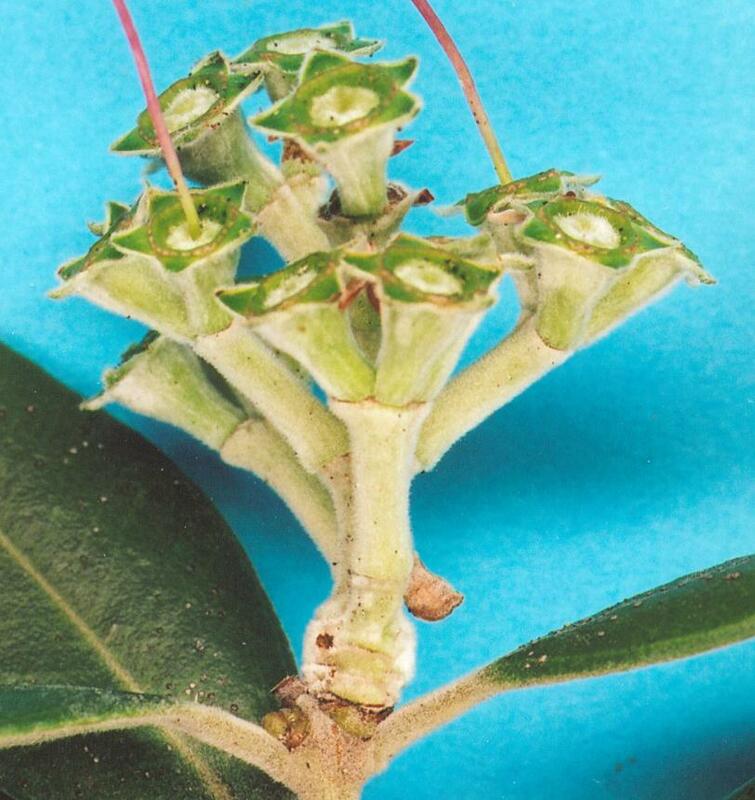 It is the only species of the family known in New Zealand and the only species of the family known to induce galls in the plant genus Metrosideros (pohutukawa and rata). 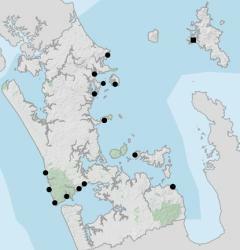 Conservation status: Locally distributed within the natural range of pohutukawa. 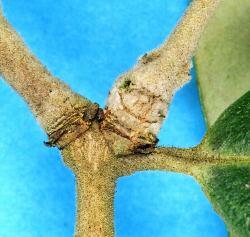 It appears to be restricted to areas with old established trees, though galls are present on young planted trees. Shoot galls induced by the fly are found at the base of new season’s vegetative and flower shoots in October and November. 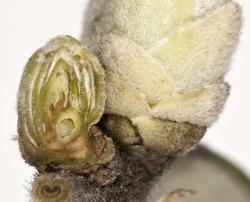 A white larva is inside the young galls. 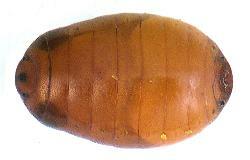 When fully grown, the larva makes a thin area in the wall of the gall and then changes into a pupa inside its larval skin which turns brown and is now called a puparium. After a few weeks the adult fly pushes its way out of the puparium and through the thin ‘window’ in the gall. 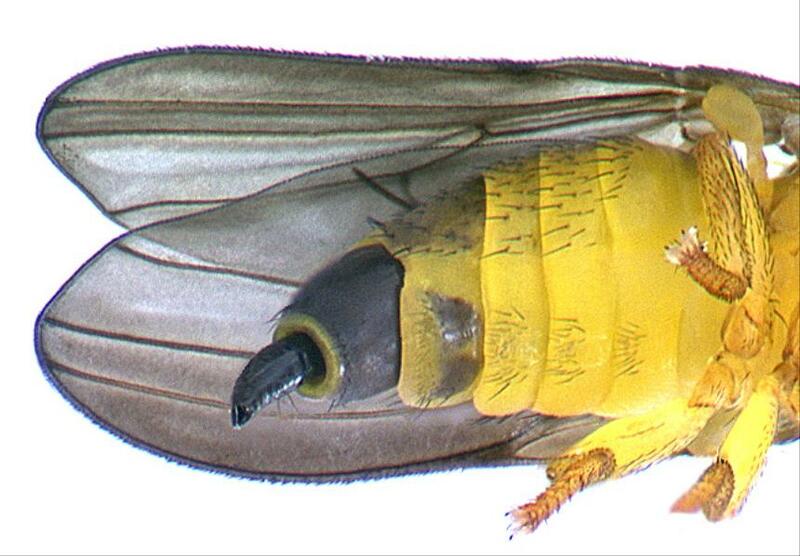 The adult fly is 4 mm long and, at rest, looks like a hover fly. 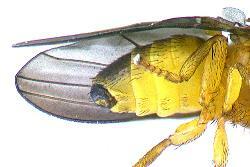 It has dark wings and a mainly yellow body covered in short black setae. 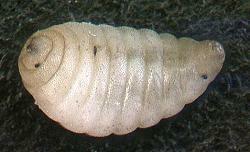 The head is typical of the genus with few long setae and many short setae. 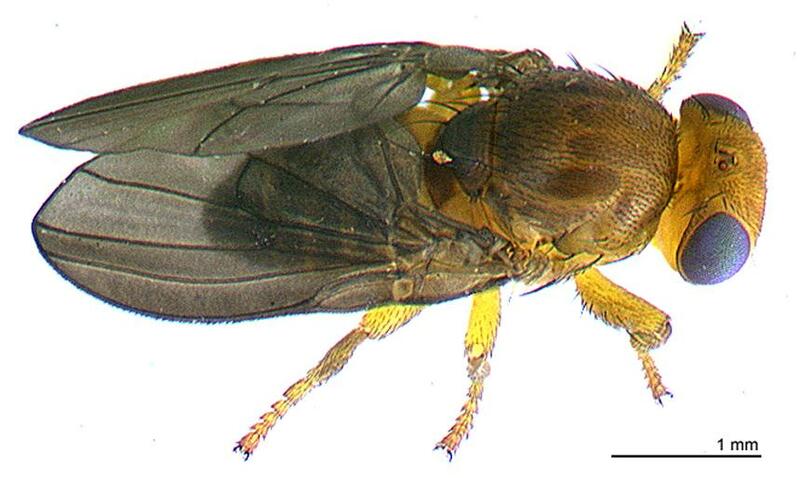 All species of Fergusonina flies have a complex mutualistic relationship with nematode species in the genus Fergusobia (Nematoda: Neotylenchidae). Fergusonina metrosiderosi is associated with Fergusobia pohutukawa Davies 2007. Their life cycle lasts 12 months and is synchronised to the phenology of the tree. In late November and early December, mated female flies use their ovipositor to insert an egg and juvenile nematodes into the base of a bud of pohutukawa, usually a terminal bud. 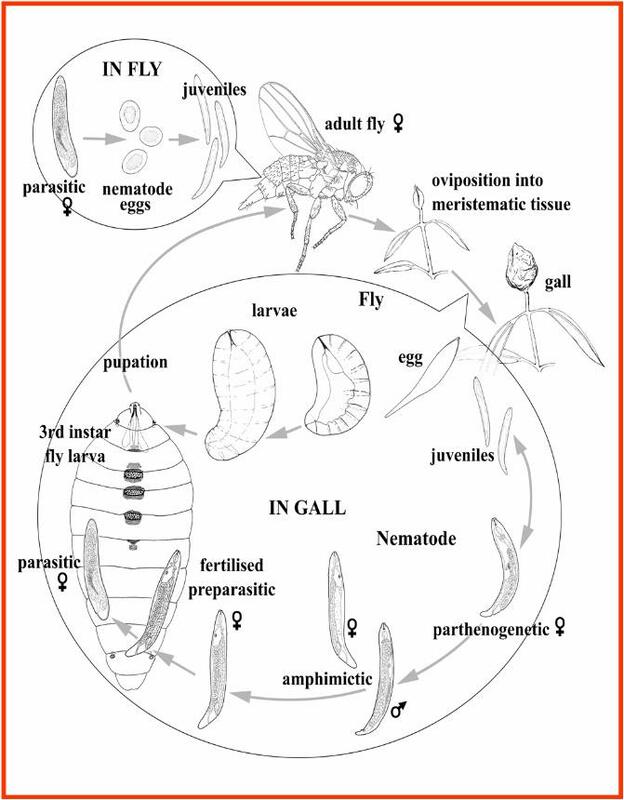 The nematodes feed on plant cells around the fly egg and larva at the base of the bud and develop into parthenogenetic females that produce more juveniles without the need to mate with a male. There are one or more generations of parthenogenetic female nematodes. When the fly larva hatches from its egg, it feeds on the gelatinous cell-sap that oozes from the cells on which the nematodes have been feeding. This cell sap is available to the first and second instar (stages) fly larvae. The fly has three larval stages and moults, changes its skin, when it passes to the next instar. In spring, when the bud bursts and the shoot elongates, the presence of the nematodes and fly larva stimulates the base of the shoot to enlarge. 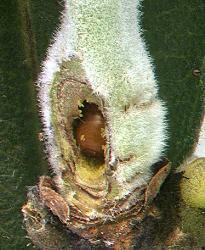 The fly larva feeds on the plant tissue and enlarges the hollow in the gall. When the third instar fly larva is approaching full size, the parthenogenetic female nematodes give rise to juveniles that develop into males and females that mate. After mating, the female nematode changes into an infective pre-parasitic stage that enters the almost fully grown fly larva. In the fly pupa, the nematode moults without forming a new cuticle and loses its feeding stylets, the oesophagus and digestive system degenerate and the epidermis develops microvilli through which it can absorb nutrients from the fly haemolymph. The nematode produces hundreds of eggs that hatch into larvae, which migrate to the ovaries of the developing adult fly. 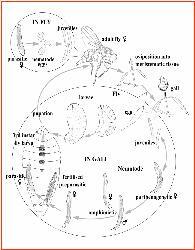 It is not known if nematodes invade male fly larvae, but they do not occur in adult male flies. The presence of the pohutukawa gall fly and its associated nematode can be recognised by the presence of galls at the base of young pohutukawa, Metrosideros excelsa, shoots. 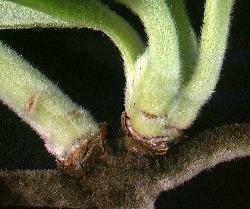 Swelling at the base of shoots may be due to the fly or other causes, but the fly gall is always hollow. Old galls have an exit hole and if broken, have remains of the fly pupa in the hollow or callous growth. Adult flies can be recognised by their dark wings and many small setae, especially on the head, which has few long setae. No natural enemies of the larvae and pupae are known in New Zealand even though they are common on Fergusonina flies in Australia. Adult flies may be preyed upon by birds, spiders or predatory insects. The gall fly and nematode have been found only in pohutukawa, Metrosideros excelsa Sol. ex Gaertn. (Myrtaceae). Other species of Fergusonina and Fergusobia are known from other plant species in the family Myrtaceae. The fly and nematode infest the buds and, in the spring when the bud bursts and the shoot sprouts and elongates, they cause the base of the shoot to swell and have short internodes (stem between leaf bases). Galls are usually found in terminal shoots. If only one shoot has a gall, it is shorter than an adjacent non-galled shoot. Occasionally, a galled shoot is killed. Most galls have been found in old trees, but they have also been found in young trees, including those in a car park near old trees. 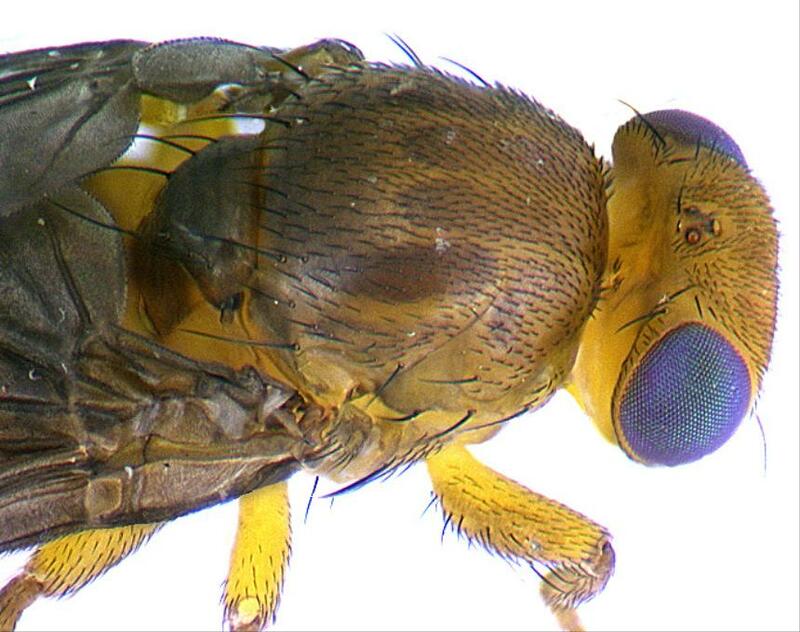 How did the fly and nematode reach New Zealand? The dependence of the fly and nematodes upon each other and the lack of natural enemies in New Zealand have been described above. 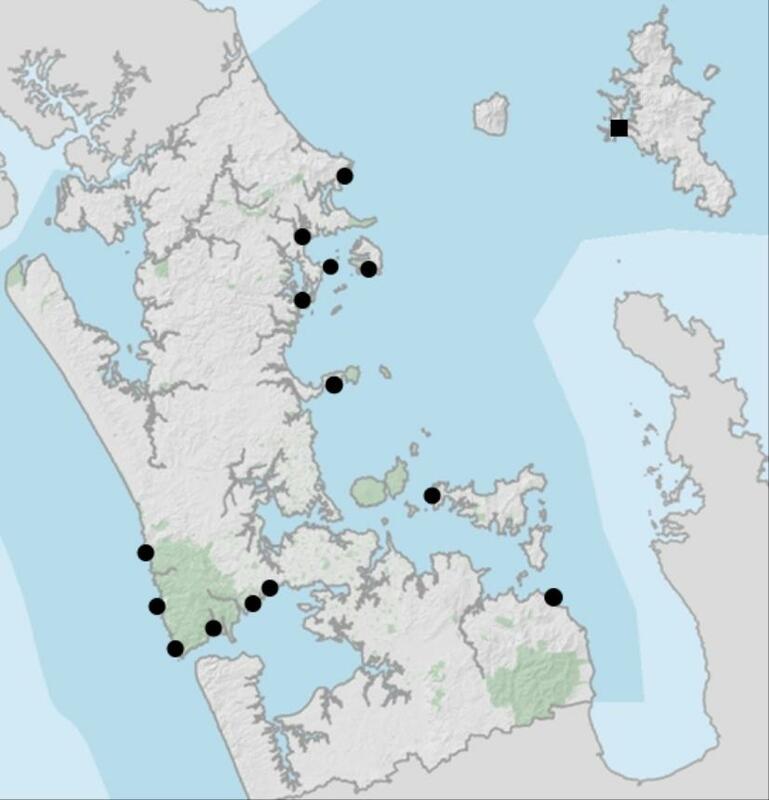 The patchy distribution of the gall fly in the Auckland Region, despite the abundance of its host plant, indicates that the fly may not readily disperse to new areas. 1. The occurrence of the association in New Zealand resulted from a novel host-switching event following long-distance dispersal via an eastern route from a Eucalyptus-inhabiting ancestor from Australia. 2. The occurrence of the association in New Zealand resulted from a novel host-switching event following long-distance dispersal via a northern route through the Norfolk volcanic rise from a Syzygium-inhabiting ancestor of subtropical origin, possibly from northern Australia. 3. Fergusonina metrosiderosi and Fergusobia pohutukawa cospeciated with the separation of Metrosideros from a myrtaceous ancestor. This hypothesis is unlikely given the early divergence of Metrosideros from ancestral Myrtaceae some 80 million years ago. Idea two is the most favoured because Metrosideros and Syzygium are more closely related to each other than Metrosideros and Eucalyptus. Taylor G, Davies K, Martin NA, Crosby T 2007. First record of Fergusonina (Diptera: Fergusoninidae) and associated Fergusobia (Tylenchida: Neotylenchidae) forming galls on Metrosideros (Myrtaceae) from New Zealand. Systematic Entomology 32: 548-557. 4 February 2015. NA Martin. Distribution map updated. 22 February 2014. NA Martin. Distribution: reworded and map updated. Annual Cycle: added nematode life cycle. Recognition: rewritten first paragraph. Martin NA. 2010, revised 2015. Pohutukawa gall fly - Fergusonina metrosiderosi. Interesting Insects and other Invertebrates. New Zealand Arthropod Factsheet Series Number 6. http://nzacfactsheets.landcareresearch.co.nz/Index.html. Date Accessed. ISSN 1179-643X.